CRS brings to the table a proven, on-site service offering that increases the quality and recovery of coolants for hot and cold metal rolling operations and directly impacts a company’s bottom line. With over three decades of experience developing advanced reprocessing solutions, we have created innovative distillation and proprietary filtration offerings to optimize the coolant treatment process for a variety of metals including aluminum, stainless steel, and other rolled metals. With CRS, you have reprocessing experts with extensive experience efficiently and effectively managing the fluid recycling process that delivers highly consistent results. In this way, our customers aren’t preoccupied with maintenance issues associated with a do-it-yourself program. CRS provides a service-based solution with a turnkey approach that allows companies to focus on their core business. CRS brings to the table a proven, on-site service offering that increases the quality and recovery of emulsified fluids for aluminum wheel production and directly impacts a company’s bottom line. With over three decades of experience developing advanced reprocessing solutions, we have developed innovative distillation, centrifugation and proprietary filtration offerings to optimize the emulsified fluid treatment process for a variety of metals including aluminum and stainless steel. 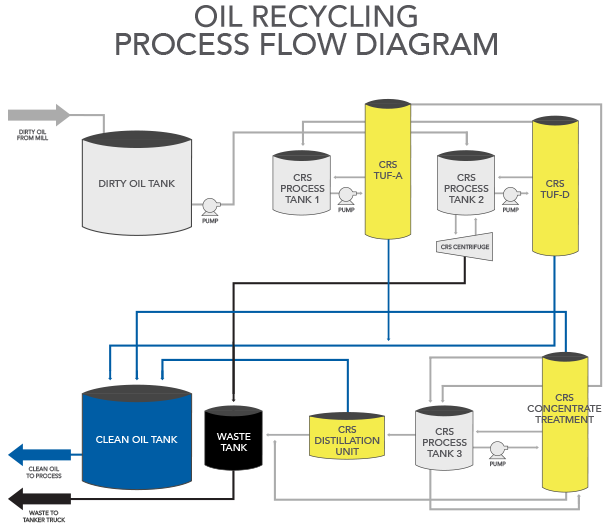 With CRS, you have reprocessing experts with extensive experience efficiently and effectively managing the fluid recycling process that delivers highly consistent results. In this way, our customers aren’t preoccupied with maintenance issues associated with a do-it-yourself program. CRS provides a service-based solution with a turnkey approach that allows companies to focus on their core business. If you have questions about aluminum wheel emulsified fluid reprocessing, contact an expert. CRS has been in the business of distilling and separating commingled materials for over 30 years. During that time we have perfected the process and achieved high levels of competency to the benefit of our many customers around the world. Having developed and employed a number of filtration and distillation technologies, we have a track record of establishing the best solution for each customer’s needs. Our solutions have been installed for numerous rolling mills and custom applications, and currently handle volumes ranging from a minimum of 1 gallon (3.8 liters) per minute to several thousand gallons per minute. Designed to scale up on a modular basis, CRS solutions can meet current demands as well as expanded needs in the future. To ensure the reprocessing delivers optimal ROI, CRS employs lab analysis, pilot tests and case history review during the fluid’s technical qualification stage. In the end, our proven process results in better quality operational fluids and rolling oils to maximize reuse and provide the highest quality recycled fluids to deliver significant cost savings. 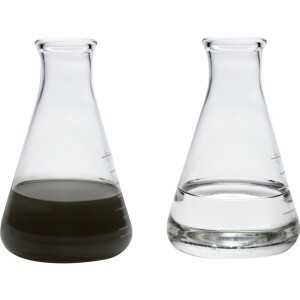 Fluid sample before and after CRS filtration and distillation treatment. Solutions are designed to meet each application’s needs, regardless of volume, to produce exceptional results. If you have questions about flat rolled products coolant recycling, contact an expert. The importance of quality control cannot be overestimated. Its impact on production, and the bottom line, is substantial. CRS maintains the highest quality standards through detailed analysis and reporting conducted by our on-site technicians. Our support is further enhanced by 24/7 remote monitoring via links to our U.S. headquarters as well as our two off-site laboratories. These laboratories are staffed with full-time chemists who are also available for immediate response and monitoring to ensure optimal reprocessing. Because the entire CRS reprocessing cycle is a closed loop that remains on site, outside contaminants cannot enter the process stream. Finally, CRS laboratories are equipped with some of the most sophisticated instruments available to analyze a wide variety of materials for our customers. With CRS, we’re experienced in handling the entire process of reprocessing industrial lubricants. Our design experience gives us insight into working within space constraints, and has led to the development of compact units to provide the best option from all perspectives. 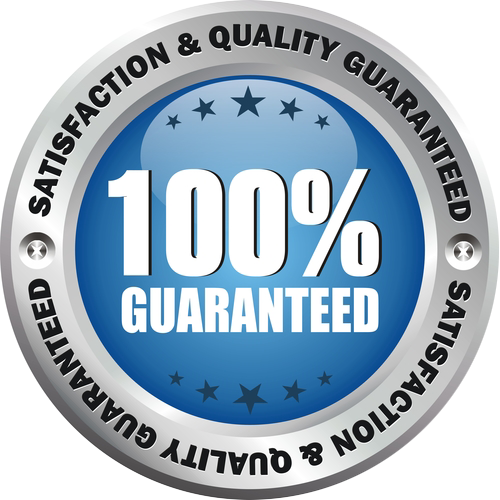 A complete lab facility provides detailed analysis and extensive quality control, and our on-site operating technicians ensure prompt, accurate results. Because of our experience and our technology, customers enjoy a higher quality of recycled lubricants. Reusing large amounts of these fluids not only reduces costs, it also minimizes waste. If you have questions about lubricant recycling and how it can benefit your company, click here to contact an expert. CRS has developed an extensive solution portfolio designed to deliver cost-effective, reliable fluid reprocessing ideally suited for hot and cold flat rolled product applications, waste water applications, wheel product applications and anodizing applications. Our specially engineered filtration and distillation offerings meet and often exceed the most demanding industry requirements. By incorporating a modular, scale-up approach, CRS can customize the solution to meet each application’s flow requirements and specifications. The result is exceptional consistency of recovered fluids and coolants for aluminum metal production and optimized flat metal rolling operations. If you have questions about aluminum industry fluid or coolant recycling, contact an expert.